Some of the most established, savvy and deep-pocketed developers in the Washington area have land holdings in the center of Springfield, and they all have experience with major projects in downtown D.C., where the J. Edgar Hoover Building site is considered one of the best development sites to become available in decades. The GSA has proposed trading the Hoover site for a new FBI headquarters. Boston Properties is a titan of Washington real estate development, having built projects for Bechtel Corp., National Public Radio and top law firms. In all, it owns 47 projects in the area totaling more than 10 million square feet — including the planned Springfield Metro Center office complex, totaling about 500,00 square feet in two buildings next to the warehouses. Given that proximity, Boston Properties could propose combining some of its land with a nearby 57-acre warehouse site owned by the federal government as a site for the FBI to relocate. Fairfax County Supervisor Jeff C. McKay (D), whose district includes the Springfield properties, said he’s discussed the idea with company officials and that it could give Boston Properties a leg up. 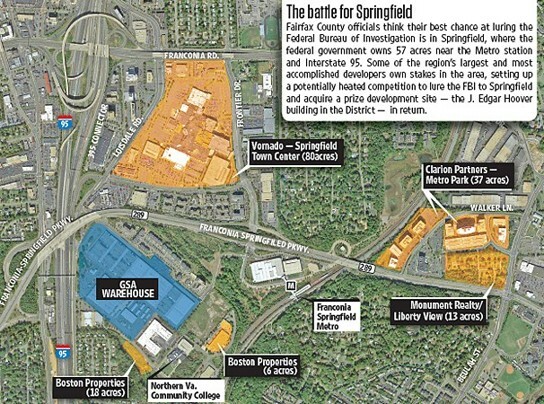 Boston Properties is not the only developer lining up plans for office development that could fit the FBI’s needs for 40 acres, or that could benefit from the FBI relocating to Springfield. Across Franconia-Springfield Parkway from the warehouses, work is under way on a town center being built to replace the former Springfield Mall by another giant in Washington real estate, Vornado/Charles E. Smith, owner of 73 commercial properties in the Washington area totaling 19.1 million square feet. The town center would likely be a major beneficiary of having 11,000 FBI employees relocated across the street. A Vornado spokeswoman declined to comment on the FBI’s search. Two other companies own properties to the east of the Metro station that could accommodate the FBI. Clarion Partners owns Metro Park, a 37-acre office plaza off of Beulah Street. Tenants at the existing buildings include Science Applications International Corp. and DCS Corp. Immediately south of Metro Park, Monument Realty plans Liberty View at Springfield Metro, which could accommodate 750,000 square feet in four buildings. GSA has a March 4 deadline for proposals. Next post: And There Are SPLINTERS in Mine . . .